The Talkabout T605 features a backlit LCD display, 20 call tones, channel scan, Dual Watch, hands-free iVox functionality, VibraCall® vibrating alert, PTT power boost for that extra transmit range when you need it. This radio built to be ready. The T605 is IP67 waterproof and is submersible in up to 1 meter of water for up to 30 minutes. It also floats, and is designed to float face up for easy retrieval if dropped in the water. Then there is the flashlight. The T605 is equipped with a large, built-in flashlight at the base with a red and white LEDs. The flashlight is also water-activated, so if you do drop it in a lake, you can find and retrieve it quickly as it floats by. The T605 gives you dual power options. It operates on a NiMH reachargeable battery pack or 3 standard non-rechargeable AA alkaline batteries for greater versatility. It has a built-in micro-USB charging port so you can charge the radio from any charging device equipped with a USB port, such as a external battery charging pack or a computer. 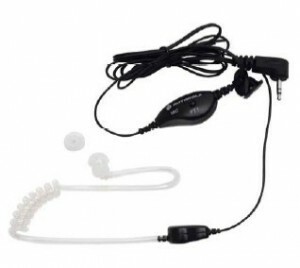 The package includes an AC charger adapter with dual micro-USB connectors plus a DC vehicle adapter with two detachable micro-USB cables so you can charge your radios on the road. Even the belt clip is ready. It's a belt clip and a whistle, so you can signal to others immediately nearby in an emergency if you can't call out. Of course, a rugged radio built for travel is not complete without a travel case, and this radio has one. The Talkabout T605 comes packed in a soft carry case with room for two radios and their accessories, so you can transport your Motorola radios in safety and style.